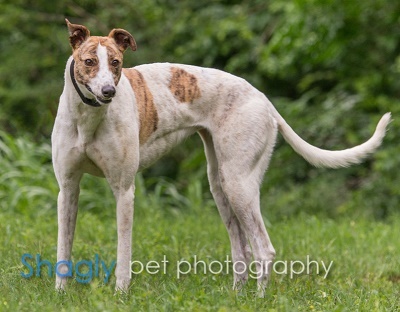 Adele is a 4 year old white and brindle female born August 10, 2012. Her sire is Lamorge Aces Up and her dam is PJ's Iwantitall. Adele was not individually registered with the NGA and has not raced. She was found as a stray in Fort Worth and released to GALT by Fort Worth Animal Care and Control. Adele has a positive titer to Ehrlichia Canis, as well as being positive to many intestinal parasites. Treatment for all of this has commenced and will last a minimum of 8 weeks. Adele has passed a cat test and is living in a foster home with cats. 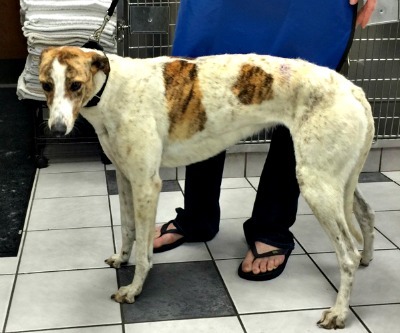 Adele has completed her treatment for Ehrlichia Canis and has a negative PCR test. She will be scheduled to complete her medical procedures soon. 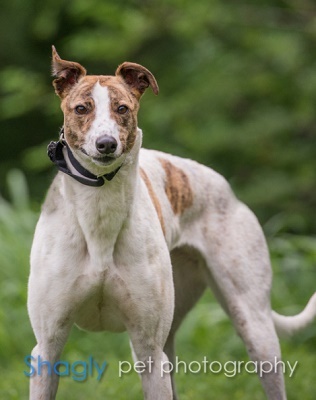 Adele has completed all of her medical procedures, and this girl is ready to find her forever home!